This week fellow SLRers Carol and John are headed south to the Cape Cod Marathon. With about 14 marathons behind us, these are among the last few marathoners of the season. Good luck to both, we’re expecting great races (and great recaps) from both of you! I’m not sure if people will be running this Sunday. I won’t be due to other commitments in the morning. I’m going to call this training season officially over, although with New York and Valley of Fire still out on the horizon people should feel free to use the MRC forum to coordinate less formal Sunday runs at Brueggers through the end of the year. My story starts on a cold (32 degrees) windy street in Chicago during the darkness of the early pre-dawn hours. With the moon shining overhead the marathoning quintet of Judi, Katie, Lois, Nancy and myself wandered across the Chicago River to meet up with Barry and Lauren Cossette before heading to the starting area. The sprawling Millennium Park and the city streets surrounding it, filled with is the start of the Chicago Marathon. While Judi and Katie were off finding where the seeded people should be, the remaining five set out to find our bag check, the bathrooms, and the “Open Corral” which we accomplished shortly before the race began. One issue though, the “Open Corral” had only one opening, the back of the corral and weÂ weren’t there. Positioning ourselves next to the 9 minute mile pace group, the corral’s chain link fence the only thing separating us with the start of the race, we made the daring decision to jump the fence when the race started instead of moving behind 20,000 other runners. When the mass of runners started to move we pushed through spectators lining the corral (since when do spectators watch people standing in a corral anyway?) and hopped the fence. I would like to report that this was done athletically and gracefully but that wouldn’t be true. Once over, we were moving towards the starting line instantly, dodging the throw-away clothes runners were tossing towards us at an alarming rate. The pre-race sight of the day was someone else’s hat landing square on top of Barry’s head. With no time for pre-race jitters, under the START sign we went and off into a tour of Chicago. The first 5K was crowded and slow. With Lauren and Barry by my side we wound our way around many of the races turns at a reasonable pace, through the canyons of Chicago’s Loop, the downtown section of the race. This run still had a feel of just going out for a Sunday Long Run with Barry and Lauren, despite the 45,000 runners around us, and despite the hords of spectators cheering us on. Actually the spectators cheered Barry and Lauren on since they had their names on their shirts. “Go Barry” and “Go Lauren” was heard over and over, to which one of us (mostly me) would add a “and Jim!” as not to cheat me out of some support. Along this section of the run Barry, having had gone on a bus tour of the city prior to the race gave me the free version as we passed by landmark buildings like the Chicago Theatre. A few blocks from the Sears Tower… yeah, I still call it Sears… we turned north through the financial district of Chicago on LaSalle St and out of the city. The second 5K moved from skyscrapers to 3 story buildings along the flat straight LaSalle Drive north of the city. The further from the city we ran the more tree lined the streets were, making our way to the Lincoln Park Zoo. Running alongside the zoo we passed a bank thermometer telling us it had warmed to 37 degrees as we progressed past the 10k point. Inner Lake Shore Drive took us to Addison St. home of Wrigley Field. It’s a shame, coming that close to the landmark, the course turns left on Broadway St without catching a good glimpse one of baseball’s storied ballparks. A group of men in cheerleaders costumes, complete with skirts, followed by men twirling rifles quickly took your mind off missing the park as you run through Chicago’s rainbow flag decorated neighborhood known as Boystown. Back in the Lincoln Park area we passed some streets that made us feel welcome: Melrose St, Barry Ave, and St James Pl. With 15K under our belt, our trio stuck together at a pace slightly stronger than planned. Feeling good we stormed through the Old Town Neighborhood along Wells Ave approaching the city where we spotted Carson’s, a rib restaurant with a bright yellow sign with black lettering. Here, we approached a water stop with porta-potties, which I had to use so I bid Lauren and Barry adieu and stopped for a minute or two. Past the halfway point I was now running by myself, although still in a thick crowd of runners. Running along the West Loop, west of the city, I decided I felt more comfortable with Lauren and Barry by my side. Rationalizing that on Sunday Long Runs I usually stop too long at water stops then catch up with my pack again I decided this Sunday run should be no different. Picking up the pace a bit I started to close the gap on them. Two miles later I passed the United Center, where Michael Jordan used to help his team come from behind, then came from behind myself to catch up to Barry and Lauren as the course turned back east towards the city. Passing the 25K mark our pace picked up a bit more. Heading through the neighborhoods of Greektown, Little Italy, Pilsen (a Mexican neighborhood), and Chinatown, the smells of distinctive ethnic foods in the air ushering me by. Somewhere here, inspired by the energy of an Elvis Impersonator singing along the roadside, I picked up my pace pulling ahead of Lauren and Barry, heading out on my own. After Chinatown comes mile 20, always a crucial part of a marathon. Mental math starts deciding how this marathon is going to go and I realize if I run 9 minute miles the rest of the way I’ll be safely under 4 hours. Adding 9 to each mile marker clock I raced to beat that time to the next marker, each time winning by 15 to 30 seconds. Turning at US Cellular Field where the White Sox play and passing the warehouses of the South Side of Chicago, with three miles left to the race I detected no weariness in my legs yet. The miles kept rolling by in less than 9 minute chunks. The mental math telling me a sub-4 hour marathon is just about clinched, a sub 3:50 is possible if nothing goes wrong. My focus tries to go from the road to the first pain of the race but surprisingly nothing hurts and the miles still seem easy. This is unlike any other marathon I’ve run before, I’m tired but not struggling! A mile to go and I wonder where Barry is. Still behind me? Possibly snuck by me? Even at this point we’re running in a crowd of runners making spotting him difficult. I listened for “Go Barry”s from the crowd but heard none. Then, at the turn at Mile 26 on a big video screen, I spot a runner with a light blue/dark blue shirt on ahead of me. Barry?!? I try to push a bit harder, with a 1/4 mile left it’ll take a lot to catch him. The only hill in the race is in front of me (really, this doesn’t even qualify as a hill compared to Sunday Long Runs, but for Chicago its a hill) I push up past walking runners, turn the corner and cross the finish line with the man in the light blue/dark blue shirt still ahead of me. Darn! I get a tap on the shoulder, look behind me, and find Barry. It wasn’t him just ahead of me, he was just behind me. While I was trying to catch the Barry impostor the real Barry was right behind me trying to catch me. After starting a run together 3 hours and 48 minutes earlier, 4 seconds is all that separated the two of us at the finish line. In an instant we have mylar sheets around us, medals around our necks, and a beer in our hand. Shivering in the cold we collect our bags, find Lauren who was only a few minutes behind us, and head of to find Judi and Katie. Shortly after Lois and Nancy finish their races and the group is done with the hard part of the weekend. Seven good runs, five PRs, several beers, and seven big smiles. This week is the official ending of the MRC SLR for the fall of 2009. What that means is you should be off running a marathon or half If you’re not (Carol, John, Erin, etc) we could still hold a Sunday Long Run. The current forecast is for rain on Sunday Morning which has a few runners planning on running on Saturday instead (see the MRC Forum for details). If there are any Sunday Morning Long Runners running on Sunday and if they need water stop support, I’ll see if I can get out and help. State your weekend running intentions below and we’ll see what shapes up. Sunday Runners and other MRCers running the Baystate Marathon or the Lowell Sun Half, good luck to all of you!!! While some are running Chicago or the Mohawk, others will be finishing up their last taper. I have to apologize, I’ve run low on water stop supplies. I can drop some gatorade at Erin Lynch’s (check your doorstep in the morning) and Ginny has a bucket that’s probably empty by now. You should have a small crowd for a relatively short run, so pick up some water and maybe some gu and you should be able to make it. Have a great last training run Baystaters, keep on chugging away Cape Codders, New Yorkers, and Manchesterers! This week’s run started with people runnin’ everywhere, overflowing from the sidewalks of East Foster and spilling into the streets. As we climbed towards Melrose Common I looked ahead and counted 14 runners, looked behind and counted 11 runners, and added me for a total of 26 of us. Turning onto 6th St and continuing on to Swains Pond Ave Paul Donahue lead the way with a pack of speedsters on his heels. As the road turns at Swains Pond and Turners pond, so did we… although Jen and Andy momentarily headed straight across, not knowing the way to go. The pond looked beautiful, reflecting the beginning of autumn colors, with a lone man fishing on the edge. As the pack went by he pulled a fish from the pond and offered it to the runners for breakfast. As a group we’re used to seeing road kill, this is the first animal we’ve seen just prior to its demise. After the ponds we head along Lebanon to Forest St to the first water stop, Ginny’s car. The second stretch of the run took us through Malden to the Fellsway East hills. With a foggy mist in the air my glasses became fogged and wet, inhibiting my vision instead of aiding it. With the side of road covered with acorns I decided to remove my glasses, tucking them on the collar of my shirt. Being near-sighted I couldn’t see past the next step, but I could see far enough to avoid rolling an ankle on an acorn. The Fells hills brought us over to the Knoll at the Melrose Middle School and water stop 2 at Judi’s car. From there we followed the Lynn Fells Parkway to Saugus. Every marathon training period I think a runner gets (at least) one run that makes them wonder “how am I ever going to run 26.2 miles”, it was becoming evident this would be mine. Running 9 minute miles took everything I had, slow heavy legs not wanting to go on.Â In the distance I could see a blurry Nick and Andy pulling me to Farm St and across Nahant to Water Stop 3, Julie’s car. 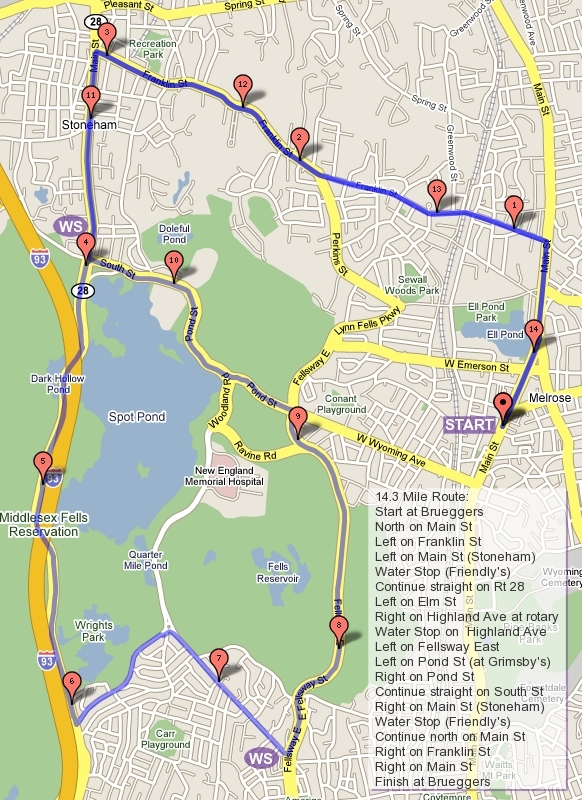 The last miles of the Fall of 2009 training were along Main St from Wakefield to Melrose. As we hit the Greenwood the sound of a car alarm broke the Sunday morning silence. An envious car across the street answered back sounding its alarm as we passed by. As we left the beeping behind us I pulled slightly ahead of Nick and Andy and focused on just getting back to Brueggers injury-free. No time to look around, just running around. Back at Brueggers, runners gathered in the cool misty air for a cup of coffee outside. Carol and John were out running 22, Jen had put in an extra few miles, some people running Chicago had shortened their route for a nice easy taper, Baystaters looked happy to be mid-taper. The misty air filled with conversations of the upcoming marathons as the morning hours passed timelessly on the sidewalk outside of Brueggers. If you don’t know what this week’s song lyrics are from, they are aptly quoted from Chicago (the band not the marathon) Does Anybody Really Know What Time It Is?